Kidney cancer isn’t as common as breast or lung cancer. 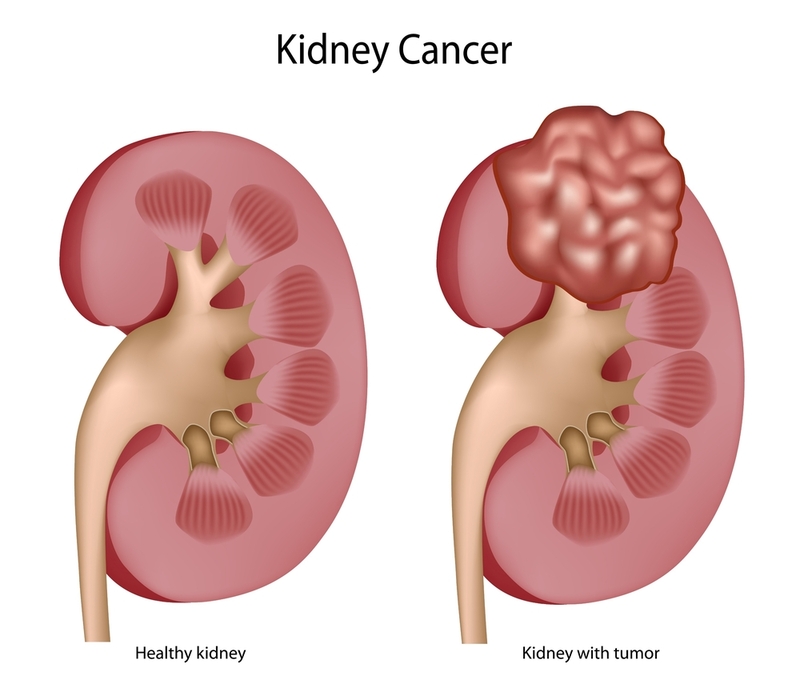 For most people, the chance of getting kidney cancer in their lifetime is less than two percent, according to the American Cancer Society. Your risk increases if you smoke, are obese, or have been exposed to chemicals such as asbestos and benzene. Sometimes kidney cancer can run in families. If you’re at high risk, talk to your doctor and watch out for symptoms. When someone has skin cancer, they might see an unusual growth on their skin. For example, breast cancer is often found when a woman discovers a lump in her breast. Because the kidneys are so deep inside the body, it’s harder to find kidney cancer just by looking or feeling for growths. Imaging tests like computed tomography (CT) or magnetic resonance imaging (MRI) can spot cancer in the kidneys. Yet these tests are costly, and they often can’t differentiate between kidney cancer and noncancerous growths. Usually, doctors only recommend CT or MRI scans for people who are at very high risk for kidney cancer because of an inherited condition, like von Hippel-Landau disease. Kidney cancer often doesn’t cause symptoms until the tumor has already grown. The most common symptom is blood in the urine, called hematuria. If the amount of blood is too small to be seen with the naked eye, it can be found on a urine test. Many of these symptoms can be caused by other illnesses, like the flu or a back injury. But if these symptoms don’t go away, talk to your doctor. During an exam, your doctor will look for other symptoms of kidney cancer that you couldn’t find on your own. They might press on your abdomen to check for a lump. Or tests might show high blood pressure or a low red blood cell count (anemia). Many different tests can detect kidney cancer. Urine tests find traces of blood in the urine. Blood tests search for chemicals that the kidneys are supposed to remove from the body. CT, MRI, and ultrasound scans create pictures of the kidneys and allow doctors to look for growths that may be cancerous. A biopsy removes a piece of tissue from the kidneys to be examined under a microscope for cancer. If you do have kidney cancer, your doctor will find out how advanced it is and whether it has spread to other parts of your body. This is called staging. It helps your doctor determine the right course of treatment for you. Many different treatments are available for kidney cancer. Radiation, chemotherapy, and surgery can help stop the cancer and improve your long-term outlook. via Are There Early Signs of Kidney Cancer? | Cancer factsheet. This entry was posted in Kidney Cancer, Other Medical and tagged blood, chemo, CT scan, hematuria, kidney cancer, MRI, radiation, surgery, von Hippel-Landau. Bookmark the permalink.